This provider of software-centric broadband products to deliver voice, video, and data services at multi-gigabit speeds recently IPO’d this past November 2017 at $13.00 per share. The stock performance has been fantastic, and now the technical analyst in me finds the high flag pattern developing over the past 30 days or so to be highly compelling. With a market cap of nearly $2.5 billion and average daily trading volume of around 600,000 shares… there is lots of room on the bandwagon to get this stock motoring higher. SWING TRADERS: we’re adding recent IPO Casa Systems $CASA to the @tradeideas HOLLY Hot List at tomorrow’s opening print. HOLLY has been all over this name, spotting opportunities left-and-right. 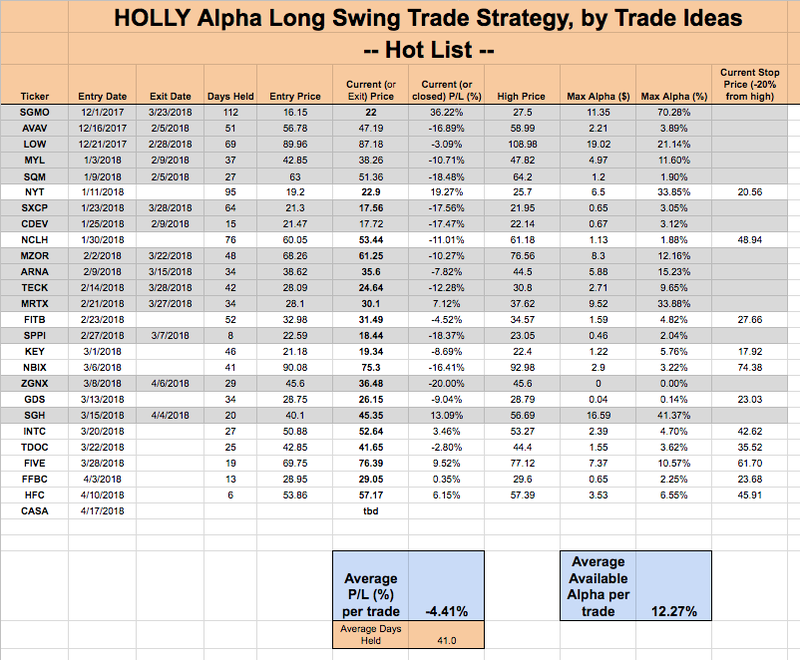 We’ll be adding $CASA to the HOLLY Hot List at tomorrow’s opening print (Tuesday April 17, 2018) and we’ll keep the name in the list until such time that we experience a 20% drawdown from the high print. If you jump into this trade with us, be sure to size your position accordingly. No exits since our last report. No surprise, as the general market has been trending up for the past 7 days or so. The portfolio, accordingly, has recovered a bit led by a 9% gain in $HFC, an 8% gain in $FIVE, and a 7% gain in $INTC. A notable laggard is $NBIX which can’t seem to catch a bid, down 2% for the past 5 days and closing in on our stop loss level. We haven’t really had a shot to make any money in this name as of yet.